Be your own kind of strong, beautiful and complete woman.. infact be the kind of woman you want to be on your terms... As a woman, I tell myself I have come to be who I am today in my own way. My journey is peculiar to me and it may look similar to other women but it's not exactly the same. I got married when I should and in less than one year after marriage, I had my first baby and two years and three months after, had my second baby. In between being a wife and mother, I was juggling a 8am-5pm job as a business development manager in an event company managing events for blue chips company. I did this for almost five years and I totally enjoyed working. When I tell people companies that I have worked for in the past and the hard work put into being part of teams that have done award winning shows, events, plus radio dramas and movies.. they wonder at me and how I was able to give all of that up to be a domestic goddess for over 8 years , staying at home and taking care of my three children plus household while I watch my friends climb their own corporate ladder. Story for another day. As a domestic goddess I have had my fair share of being overwhelmed, feeling as if my friends in the corporate world were living more meaningful lives while all I was doing was my best to maintain my life as a #WomanWifeMother ..and add "ministry" on the side and you will understand how dramatic my life was. Looking back now, my domestic goddess days afforded me the time to learn and be mentored in ministry, marriage and business. It gave me time to volunteer and be useful in my own way. It gave me time to grow myself and develop to the woman I have become. Add all my time as a worker , domestic goddess and now Coach, you will know that I have come a long way from the young lady that got married almost fourteen years ago.. singing all things bright and beautiful. . Lol. I have seen the good and challenging sides of each phase of my life and I am glad to say I have found my rhythm to be my own kind of woman... My journey to being a complete woman is still in progress but I can say confidently I have made progress, developing myself to be the kind of woman that her life can encourage and inspire others to be their own kind of #WomanWifeMother. So if you want to be your own kind of woman. 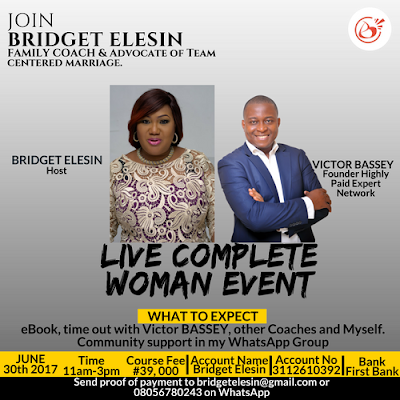 join me and connect to know more about being a complete woman as I hold my first live complete woman event, where I and my business coach Victor Ekpo Bassey will be talking through practical sessions that will help us discover self, maximise our potentials plus 10X our businesses. Fee - N39,000 paid into First bank account no 3112610392. 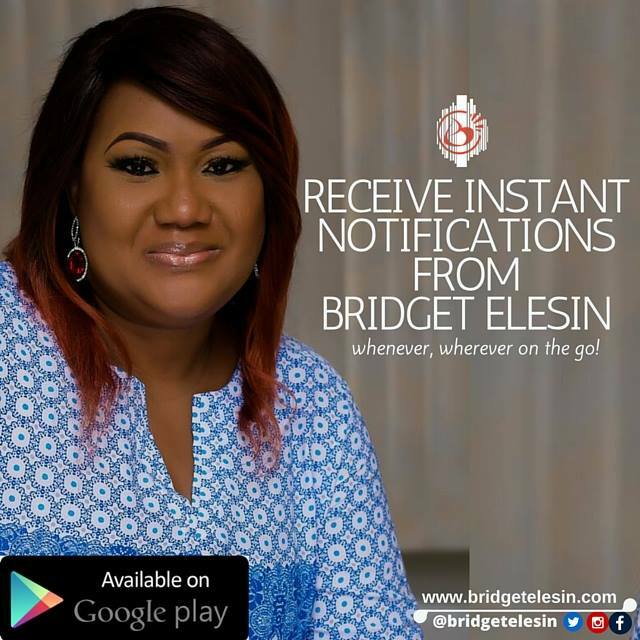 Note - Send proof of payment to: bridgetelesin@gmail.com or to 08056780243 on Whatsapp.